This one-to-one scale fully automatic air soft gun incorporates a battery operated motor to perform the entire action. A constant pull on the trigger allows for fully automatic machine gun-like rapid firing. Includes safety glasses and 60 starter 6mm BB bullets. For legal purposes tip of gun barrel must be permanently colored in blaze orange. I really like my ak-47. Keeping in mind that essentially it is a BB gun and meant for tarket practice and not for great self defense. Still, it will kill some animals like birds, etc. I intend to give this to my sister to help her protect her property since her husband died recently. Yes, it won't make her absolutely safe; but, even a BB gun will make someone think twice about running at you. Just aim for vulnerable spots like their eyes. As I've said in the past I would love to have one like this that shot .177 caliber ammunition. I don't want to hurt anyone; but, better you have something for home protection than nothing at all. At least it would slow down an attacker whereby you might get to knives, etc to protect your family. We never know in today's society what might be just around the corner. I would say it is something a person who can't or doesn't want to get a gun that would kill someone; should be more willing to get and use. You just need to make sure you watch the power you have left when you use it; so, you keep it charged lke your suppose to. The only thing I regret is that it isn't a pellet gun (.177); otherwise, I love the gun and might get a couple more of them in the future. The previous review was invaluable to me...it would have taken me awhile to figure out the loading mechanism, so thank you Nathan. The manual must be for a similar gun because the only difference is how to load it(manual thinks it came with a loading rod). It should be noted that the english in the manual looks like it was added as an afterthought, spelling and grammatical errors throughout. Would it kill them to do a proof read? Regardless of the manual difficulties the gun works extremely well, both semi and full auto. It even comes with a charger for the battery, although apparently there is a danger of OVERcharging the battery...so no plugging it in and going to sleep. Anyone who wants to step up from that crappy bb pistol is going to love this gun. If you plan on firing full auto then I suggest you get a lot of BBs because it can go thru a clip damn fast. My god this gun is amazing. it looks and feels like the real thing. minus the big bang that comes with a real gun it even sounds the same. this gun comes completely as advertised full and semi auto at the flip of the saftey lever. the only incongruency with this gun is the manual that came with it. parts of the manual don't actually coorespond to the gun. the most important of which is the loading mechanism. this took me a few hours to actually fugure out cause i was going off the manual which is wrong. there is a small door on the top of the clip on the opposite side where the bullets actually feed into the gun. just pour in the bullets and wind the wheel on the bottom until the BBs appear at the top. prettu simple really and a huge capacity. 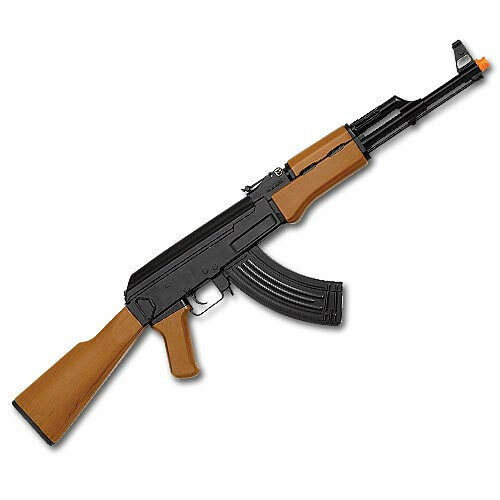 i totally recommend this for any AK-47 fans.